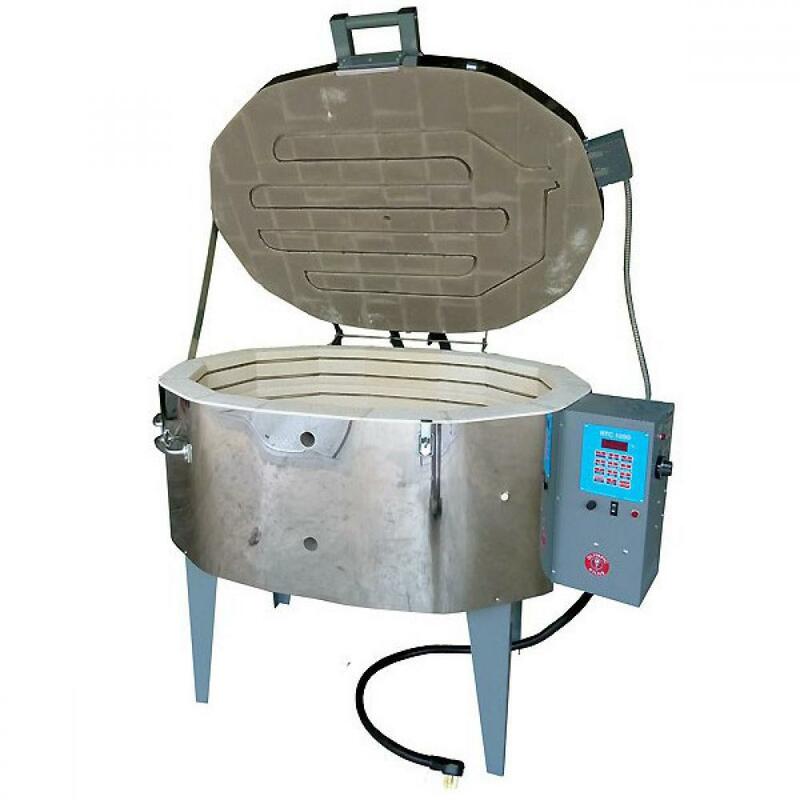 Glass firing Oval kilns are designed for large workloads and unusual shapes that do not fit in a cylindrical or square shape kiln and used for fusing and forming of glass shapes and heat-treating. 240-208 volt glass fusing models are equipped with a lid element for the fusing segment of the glass firing and body elements for the ramping up-down and annealing segments of the firing. An infinite switch controls the intensity of the heat coming from the lid element. If the switch remains in the OFF position, only the body elements will heat the kiln. If the infinite switch is turned to the High position, all elements, both body and lid, heat at the same intensity. The kiln operator may choose to lessen the intensity of lid element by turning the switch down. Models come equipped with pilot light, 18" tall metal stand or frame, stainless steel jacket, and Bartlett Instruments 3 Key electronic controller. Controller data is entered by scrolling through the up and down arrows for the desired temperature for ramp-hold programming. Model comes with attached tall frame or tall stand, lid lift assist, peephole plugs, instruction manual, and warranty card. Two-year warranty. Upgrade to the 12 key digital RTC-1000 controller for more ramp-hold user programs and multiple features including delay start, preheat, skip step and many more for precise firings every time. Messages and Information are available for reviewing a firing profile before or during the firing, and for viewing the current segment the firing is in. Other options include a bead door, quartz glass viewing window, lid element in quartz rods, Type S thermocouple, vent and much more! Furniture Kits for 240-208 volt glass fusing kilns include 2 layers of shelving for stacking ware, assorted square posts, ceramic paper and a one pound bag of kiln wash. Choose the standard furniture kit for the model chosen or build your own with shelves and posts in the quantities required. Standard kiln furniture for ovals requires to half round shelves on either end and a rectangle shelf in the center to form a layer of shelving.